Interview questions for teachers explore the essential competencies and teacher skills needed for achieving effective performance and desired outcomes in any teaching job. The core competencies identified as fundamental for teaching professionals include planning and organizing, adaptability, problem-solving, judgment, communication skills, resilience, high energy levels and integrity. Prepare for these competency-based teaching interview questions and make sure you are ready to successfully handle your teacher interview. Good planning requires the ability to establish clear objectives and priorities, schedule time, resources and activities effectively and efficiently and carefully monitor progress and results. Describe your planning process for a new project or study unit. What methods do you use to monitor student progress? How have you incorporated technology into your lessons? What do you do when your teaching plan for the day is upset by unforeseen circumstances? Give me an example of when this happened recently. What have you done in order to manage your time more effectively? 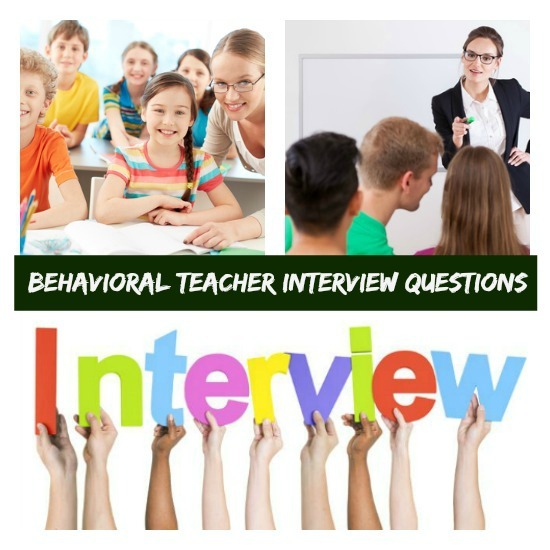 How to answer behavioral interview questions with sample behavioral interview answers. How have you allowed for different learning styles when teaching a subject? Classes incorporate students with differing abilities. How have you met the needs of students with both low and high abilities in a particular subject? Describe a lesson where you had to use differentiated instruction. In what ways do you encourage students to be accepting of one another? As a teacher you need to be able to detect problems and gather all the necessary relevant information, consider all relevant facts and information and consider all alternatives before deciding on the most appropriate action. How have you handled a student who was not completing his or her homework on a regular basis? How have you handled a conflict situation between two or more students? Describe a situation where a lesson clearly didn't work well. What did you do? Tell me about a time you had to make a tough decision about a student. Can you handle disappointment and opposition while maintaining effectiveness? How have you handled situations when students appeared disinterested or bored in your lesson? How have you managed a situation where you felt you were losing control in the classroom? Describe a time you had to deal with angry complaints from a parent about your teaching methods. How have you responded when students have let you down? What has been one of the biggest obstacles you have had to overcome to reach your objectives as a teacher? A teacher needs to maintain a high activity level without losing effectiveness. What extra curricular activities have you helped with? Tell me about a time you had to catch up on an accumulated backlog of work after a very busy period. What activities in your teaching day require the most effort? What types of positive reinforcement have you used to encourage students? How have you supported under-performing students? What approach have you used to motivate students to actively participate in class? How do you encourage students to use their initiative in your classroom? Teachers are expected to promote and maintain ethical and social norms within the learning environment including maintaining confidentiality, presenting truthful information and adhering to school policies and regulations. They also need to display honest insight into themselves. How have you dealt with situations where students have confided important information in you? How have you reacted when students have broken the rules in your class? Which subject do you believe is your strength and what do you consider your weakest? Teaching requires active and attentive listening skills, the ability to express ideas effectively and present information effectively. Teachers should adjust language and terminology to meet the needs of the students. Expect these sort of interview questions for teachers. Give me an example of when you had to present complex information to your class. How did you make sure they understood? How have you encouraged students to contribute their ideas and opinions in the classroom? Tell me about a situation when you had to persuade a student, colleague or parent of your point of view. What steps do you take to try and establish rapport with your students? Tell me about a situation when you had to be especially sensitive in communicating negative information to a parent or student. How did you go about doing this? This explores your ability to be proactive in generating ideas and activities for improvement and finding creative solutions to problems and issues. Describe some innovative teaching techniques you have used. Some students finish their work sooner than others. How do you deal with the free time they have? What curriculum materials have you recently developed? What improvements did you make to the physical appearance and layout of your classroom? What effective methods have you used for classroom management? What are your strengths as a teacher? 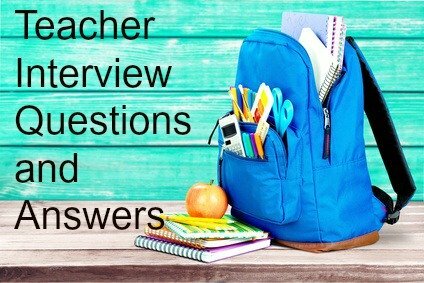 How do I prepare for a teacher interview? These excellent teacher interview tips will set you on the road to success. 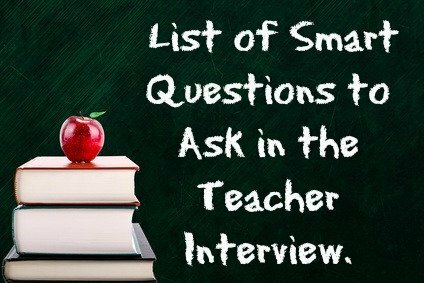 Be ready with smart questions to ask in your interview.